Western blot analysis of extracts from serum starved HeLa cells, untreated (-), insulin-treated (1 μM, 30 min; +), or insulin and λ phosphatase-treated (+), using Phospho-4E-BP1 (Ser65) (D9G1Q) Rabbit mAb (upper), 4E-BP1 (53H11) Rabbit mAb #9644 (middle), and β-Actin (D6A8) Rabbit mAb #8457 (lower). 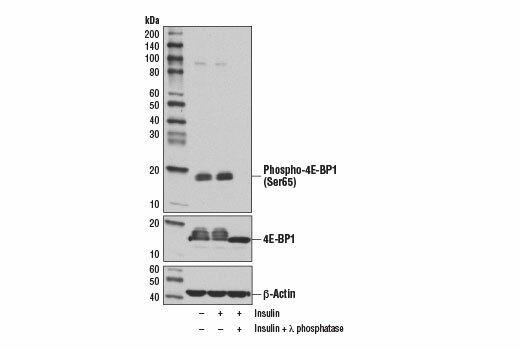 Phospho-4E-BP1 (Ser65) (D9G1Q) Rabbit mAb recognizes endogenous levels of 4E-BP1 protein only when phosphorylated at Ser65. Monoclonal antibody is produced by immunizing animals with a synthetic phosphopeptide corresponding to residues surrounding Ser65 of human 4E-BP1 protein.